WomenOnTheWall.org has asked CHQ readers and friends to join parents, grandparents and taxpayers across America who are saying #NotMyChild to the “Medicalization of Our Schools” through Medicaid. Anita Hoge, Co-Founder Child Abuse in the Classroom, Karen Bracken, Co-Founder Child Abuse in the Classroom, and Alice Linahan, Vice President of Women On the Wall have launched an urgent appeal to President Trump to stop what they have described as the grandest expansion of the Nanny State in the history of America. They believe this expansion to be one of the most diabolical, intricate, and subversive schemes to plague the landscape of American public policy toward Socialism. This atrocity, they say in their appeal to the President, is "The Medicalization of Our Schools." According to Anita Hoge, Karen Bracken and Anita Linahan the view from the classroom of today would astound onlookers that mental health and social, emotional, and behavioral interventions have replaced academics. With these wrap-around mental health services and interventions into personalities, values, beliefs, and dispositions at school, teachers are expected and forced to monitor and collect personal behavioral data on our children that has nothing to do with education. From a purely educational viewpoint, this could be termed "The Destruction of the American Educational System." From a health care perspective, this could be viewed as "The Subversion of the World's Finest System of Health Care." From a societal vantage point, this could be described as "The Subduing of the American Family." Because of the integration of business and labor, this could also just as accurately be dubbed, "The Collectivization of American Capitalism." Analyzed from a public policy perspective, it could be called "The Demise of Representative Government." Anita Hoge, Karen Bracken and Anita Linahan say all of these titles would be accurate because each of them describes different appendages of the same program. What is involved in the "Medicalization of Our Schools?" At issue is Medicaid with screenings and interventions that take place under the cloak of prevention and "health." In reality, say Hoge, Bracken and Linahan, if left unrestrained, it will become a "seamless web" through which no one will fall and ultimately no one escapes. The merging of federal data in HR 4174 escalates this agenda. To add your name to this urgent appeal to President Trump to end the “Medicalization of Our Schools” go to WomenOnTheWall.org. The universal screening of every normal child for social, emotional, and behavioral mental health problems has become the policy to identify as many children as possible for free federal Medicaid money. Our schools are milking the system through bureaucratic maneuvering. This future impetus combines Education and Welfare programs into a common thrust that appears to have bypassed our state legislatures. The fiscal impact of the merging of education and healthcare has not been thoroughly researched as the Medicaid program spans birth to age 20. Yes, say Hoge, Bracken and Linahan, American children are in danger of pure behavioral conditioning as a lucrative business. Our children are victimized by the intruding arm of government moving toward a controlled monopoly. The larger wheel of implementation includes FERPA, Family Education Rights In Privacy Act, and ESSA, Every Student Succeeds Act, and both are to blame for the forward movement of these destructive combinations that include data-mining of our children, the identification and labeling of normal children as mentally disabled but not special education, psycho-behavioral interventions to change American children toward this collectivist state, and Medicaid that will pay for this abomination with its tentacles into the family with eventual case management in an Individual Family Service Plan. This plan assures that every American child will be identified with a unique national ID and a re-cycling system of behavioral interventions laid out in ESSA. The impact of a child having a DSM code (Diagnostic Statistical Manual For Mental Disorders) on their permanent record because of a mental health Medicaid reimbursement would have many future consequences including access to higher education, getting a job, or never owning a gun which would erase the second Amendment in several years. American children are at risk of losing America in their future. We believe that if he was made aware of the destructive ramifications of these government programs President Trump could and would stop the “Child Abuse in the Classroom” that is being thrust on our American children today. Former President Obama had issued an Executive Order that unlocked the doors of privacy which now allows our children to be data-mined of their personal information which includes social, emotional, and behavioral information. FERPA must be changed. Anita Hoge, Co-Founder Child Abuse in the Classroom, Karen Bracken, Co-Founder Child Abuse in the Classroom, and Alice Linahan, Vice President of Women On the Wall have launched this appeal to President Trump requesting that the truth be told to parents about the conditioning techniques codified in ESSA and performed without informed written parental consent that can be stopped by our President. 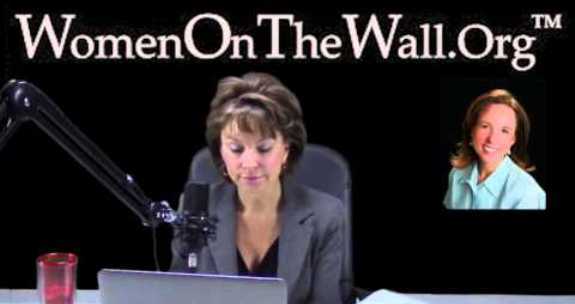 We join WomenOnTheWall.org in appealing to President Trump to take the steps necessary so that America will continue to be the guiding light of the world, to educate our children with the best education in the world, and prove to the non-believers that our children can compete with anyone in the world. To add your name to this urgent appeal to President Trump to end the “Medicalization of Our Schools” go to WomenOnTheWall.org. Submitted by MikeyParks on Tue, 02/12/2019 - 16:40. The Left never sleeps and operates best in the dark. Getting their tentacles out of our educational structure at this point will be a Herculean task. God bless WomenOnTheWall.org! Submitted by jgo on Tue, 02/12/2019 - 15:31. Submitted by oldtimefarmers on Mon, 02/11/2019 - 14:33. Having been paying attention to Women on the Wall for many years now, I know of no other group as knowledgeable about and dedicated to reform of State and Federal education. They were all over the common core imposition on our schools, providing podcasts with one of two lone dissenters in the group that created the common core math standards. It was from these women that David Coleman's name became linked in my mind to those standards and the College Board that produced Advanced Placement United States History standards (APUSH) that teach our high school's brightest why they should hate American from Communist Howard Zinn's view of history. They told the tale of Microsoft's man on the board of the Texas curricular selection committee. With respect to our children they have been screaming from the rooftops about the loss of privacy rights, individualized digital indoctrination, psychological evaluation by unqualified teachers, intrusions into the family lives of all Americans, etc. In short, education is the ultimate battlefield for the future of our civilization. Ignore the globalist boot on the throats of our children and families at our peril. Shall individual freedom and liberty become lost in the dark of humanity's past? Go to the link and sign the letter to President Trump. Submitted by email_registrat... on Tue, 02/12/2019 - 15:17.